Our Products >> Poster of the Constitution Signers Painting 36" x 24"
Your children or guests will love to identify with their founding father by finding where they were in the famous painting called "Scene at the Signing of the Constitution of the United States" or "Signing of the Constitution". This is a copy of the famous painting by "Howard Chandler Christy". The original painting was vandalized in 1967 and the slash was "painfully" repaired. The repair revealed vibrant colors not thought to exist. 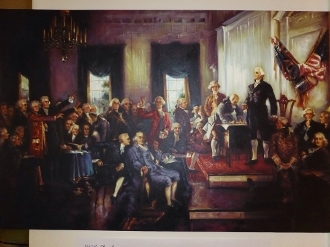 Poster of the Constitution Signers Painting 36" x 24"